Yesterday was my B-day. Yes, I have now officially entered my mid-20’s at the ripe old age of 24. But seriously, if you ask like a random 15 year old they will tell you that 24 is hella old. Better yet, ask a 6 year old, and you might get a blank stare saying “Is such a thing even possible?! ?” It is true, I have reached this tremendous landmark and will never be go back to the good old days of early 20’s. Depressing. Sorry. But, what I really wanted to tell you is how AWESOME my friends are! I got emails, phone calls, cards, chocolate, a picture frame and packages and an awesome, totally fun night at the Mexican restaurant. 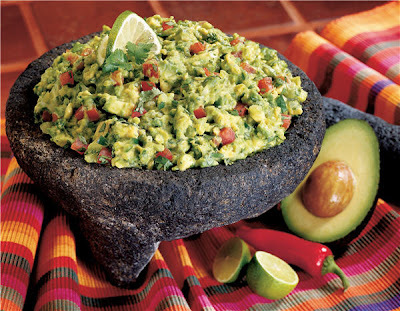 Complete with guacamole (in a crazy heavy lava rock bowl, like the one in the picture), enchiladas, a strawberry daiquiri and a huge-mongous slice of chocolate cake with a really skinny yellow candle in it. I also got calls from my family, including a little improvised birthday song from my nephew who will be 2 in like a week and a half. SUPER CUTE! Birthday success, now I get to go back to normal you-ain’t-so-special-today life, except from now on I have to do this as a 24 year old. Keeping in like with last year’s post, my prime factors are now 2 and 3 (2^3*3=24). I’m out of the full on prime numbers until I turn 29. But seriously, we’re not going to talk about that now. Posted by R at 10:08 a.m.